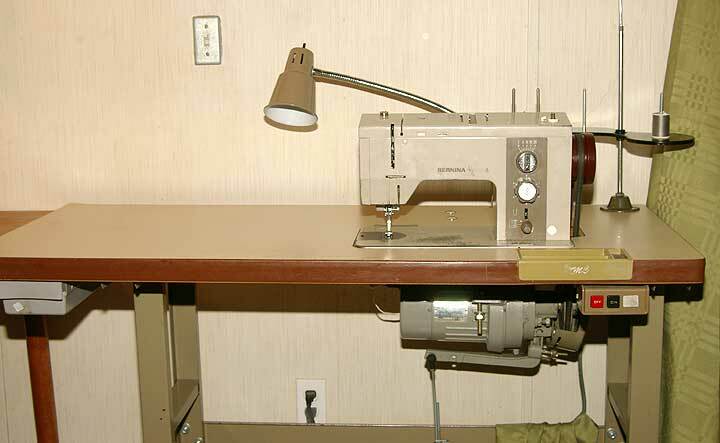 The 950 and the 217 are the well known Bernina industrial machines. 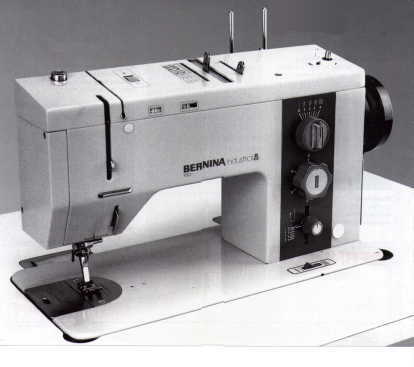 The 950 and the 217 are no longer offered by Bernina. The 217 is still in common use in sail lofts and for other zig-zag applications. The 950 is useful when a variety of stitch functions are required. In use in small scale and cottage industries. More stitch functions are available compared to other industrials. The 950 is for normal clothing weight operations only. It is designed for moderate speed and fair production life. It is not for heavy goods. I've serviced machines where the needle bar driving link was snapped in use while sewing bags. The last few years of Bernina 950 production included a tension release mechanism where the tension would release any time that the foot raised itself approximately 1/4" or higher. One did not need to raise the hand lifter or use the knee lifter to raise the foot as the only means to release the thread tension. Just the act of the foot sewing upon approximately 1/4" of material would release the tension. This includes the crossing of any seam, hem, piping, binding, etc. that exceeded this figure. This helped to protect the machine and effectively prevented the successful use on heavy goods such as many types of canvas, webbing, bag sewing, jeans hemming, etc. I'm guessing that this change was not by accident and likely was in response to an increasing number of customers attempting to use the 950 well outside of its intentional design range. The release tang that accomplished this is easily accessed below the top cover. A quick push down and 90 degree counterclockwise turn of two spring loaded latches on top of the cover allows access in just a couple of seconds. Some owners have easily disabled the tension release by observing the action of the mechanism and bending the tang to alter it. This still allows the tension release to operate when the hand lifter or the knee lifter is used to raise the foot, and effectively configures the machine to its earlier production state. Strongly not reccommended as the machine is not designed for heavy goods. Still, many machines were and are being used for heavy goods. Check all used machines carefully before buying for signs of hook wear, especially worn hook points. Use a magnifier to check the hook point. Check for excess play in the side to side motion of the needle bar rock frame and check for play of the needle bar itself as it slides in the needle bar rock frame.